In some areas they use the common name Brick Caps. Sometimes, but less common, it's Brick Tops. It goes back a ways of course to the era when bricks were pretty much the same color - red. 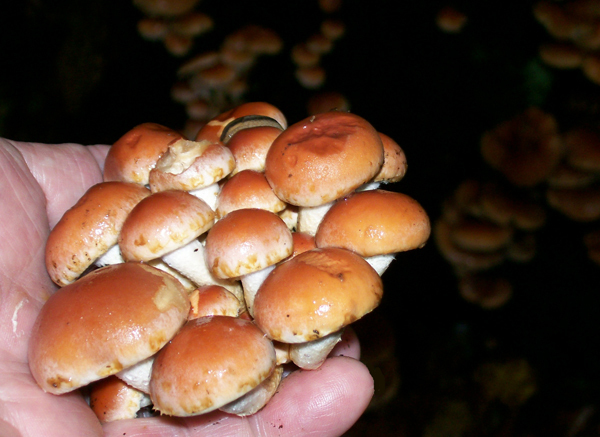 No matter what you call them they are better than what is classified in many mushroom guides. Several rate them a 'Good' edible. My opinion is 'Very Good'. A nice mushroom taste and a nice crunchy texture. Brick Caps are pretty much a Fall mushroom although they can be found in late summer when the conditions are right. I like to gather these after the leaves start to really start come down, generally after we have had a frost. At that time you will find hardly any bugs, just an occasional slug/snail. 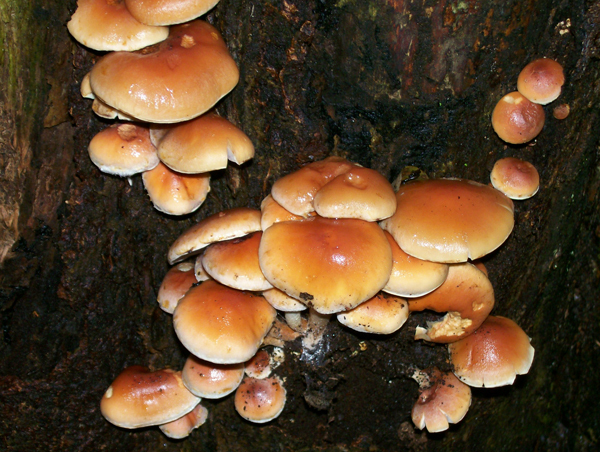 They grow in clusters, many times several clusters, on deciduous stumps and dead tree trunks. They are not a large mushroom. Caps sometimes can get 4 inches or a bit bigger. However, you don't want the larger caps if you are collecting these to eat. It's the dinky little ones up to an 1 1/2 inches or smaller that make the best eating. Here's a close-up of one of the groups from the stump above. 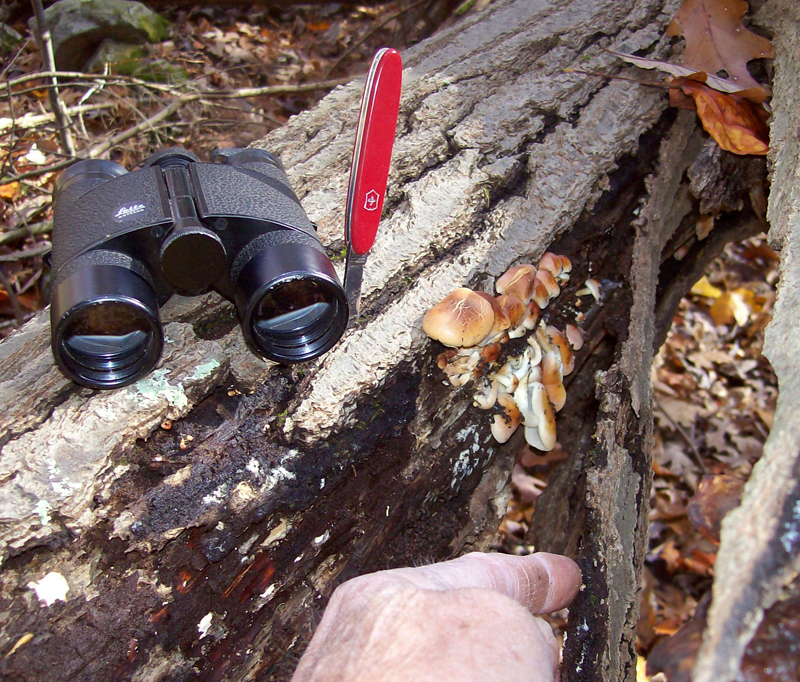 Carefully pull a cluster from the tree stump and review the details. The cap is redish, like an old brick, in the majority of the center area of the mushroom and light redish/orange or yellowish orange along the margin. Click for a Close-up view from the side. >>>> Click for a Close-up view of the top. Now flip the cluster over and note the other details. Starting with the STALK. The stalk can be characterized as long, mostly. White at the top with whitish hairy projections. As you get lower on the stalk it gets progressively less whitish and starts to turn redish/orange near the base. The cap has an inrolled margin when young and, while still young, has a cobwebby veil that covers the gills. 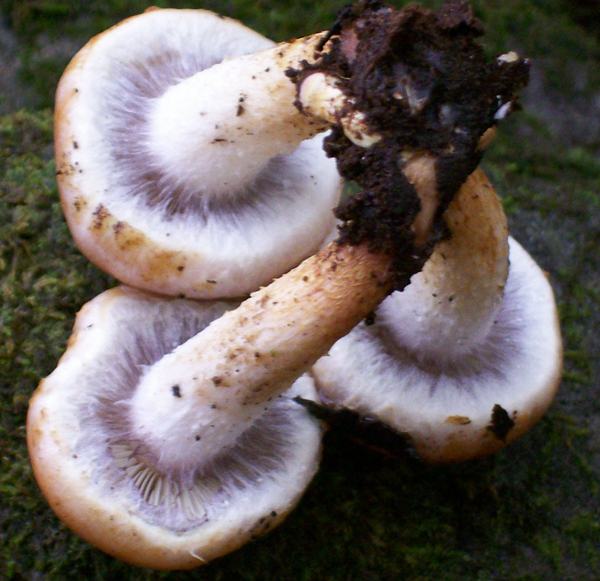 Gills are attached to the stalk. 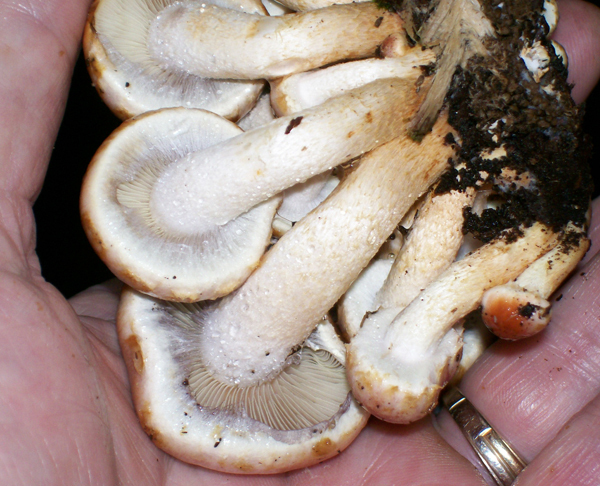 Gills are very light gray at first and as the mushroom matures turn purple from the spores which are also purplish. Here they are in the strainer after being washed. If you look close you can see the gill color in some of the bigger caps and the stalk/stem features as well. 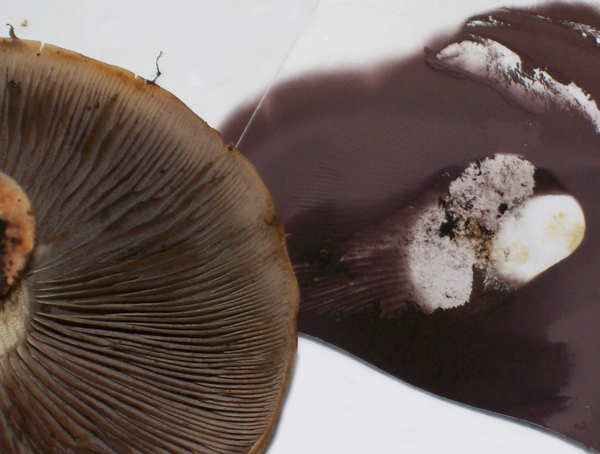 The gills get quite purple when the mushroom is bigger and more mature. Those bigger caps are the ones you want to check out while you are right there in the woods with a bunch of clusters on the log. Gill color is important to determine. These mushrooms can hide pretty good ! Sometimes you'll look through your binoculars at a far off tree trunk because you see a few 'scouts' poking out of rotting bark crack. If that trunk is far away you may think that it is not worth the walk to it to pick just a couple of small caps. ----- you may just be rewarded. Just under the loose bark there could be many, many more. I have found bonanzas of these, on occasion, by removing bark in several areas of a tree where the scouts had exposed themselves. Best practice is to gather Brick Caps in clusters from the tree stump. ( as is it's cap, gill, spore and stem color and habitat on deciduous wood only ). 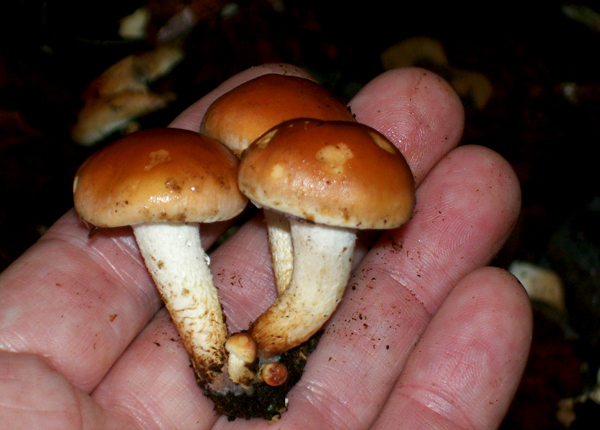 Although there will be 'individuals' seen while many clusters are present, the major characteristic of this mushroom's growth habit is it's clustering nature. look-alike maverick on that tree stump/trunk. 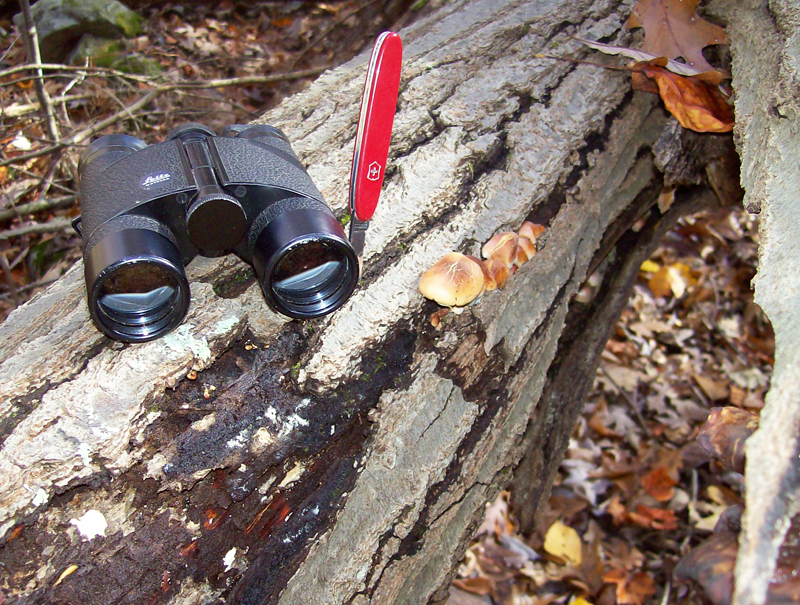 Another best practice is that once you have identified these groups of mushrooms growing on the log, stump or tree trunk, gather only the small ones. They have the best flavor, texture and hardiness to the cleaning process when you get home. man-handle them by agitating in the water. 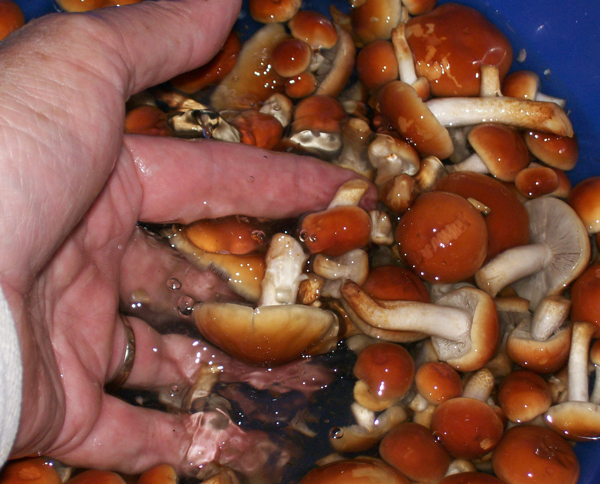 They won't break apart into a bunch of itty-bitty pieces like some other mushrooms. And they don't soak up water like a sponge. They clean up real good. 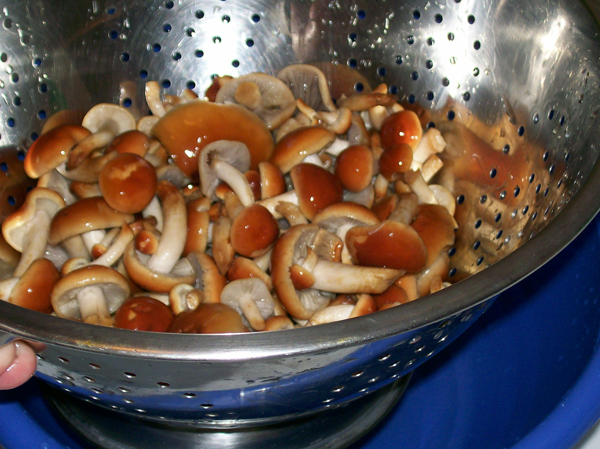 Take them from the water and put into a strainer - change the water - add the mushrooms again - agitate again, remove to strainer again and they will be ready. DATE - October 24, 2009. FOUND - Laurel Hill State Park, Bakersville, Pa. area. 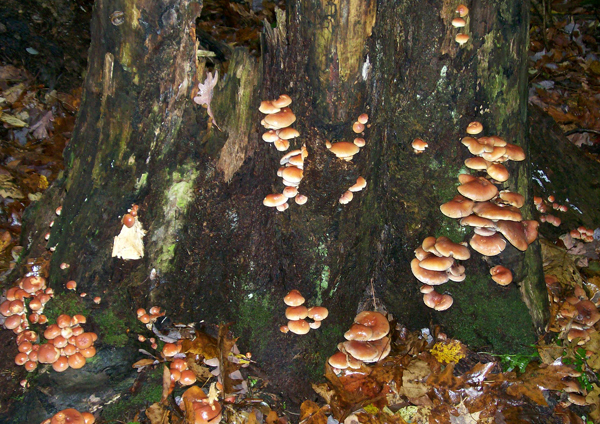 Several clusters were found on both sides of an old oak stump. Weather conditions: Wet. Cold drizzle on the day found. Mostly for the week before the weather has been dry. However, there was a frost about 1 week before. 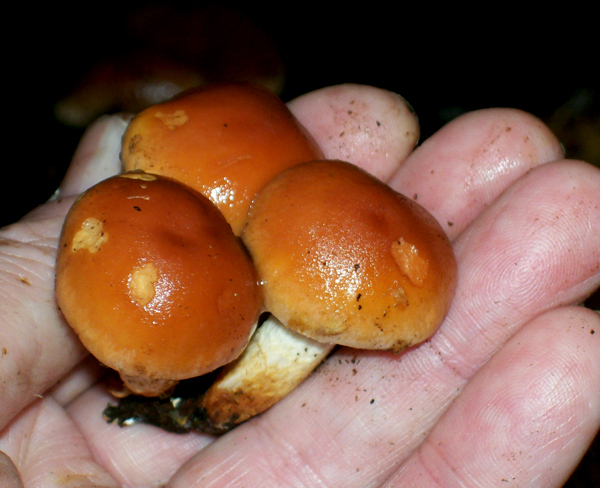 I would characterize the two weeks prior to finding these on the damp side.